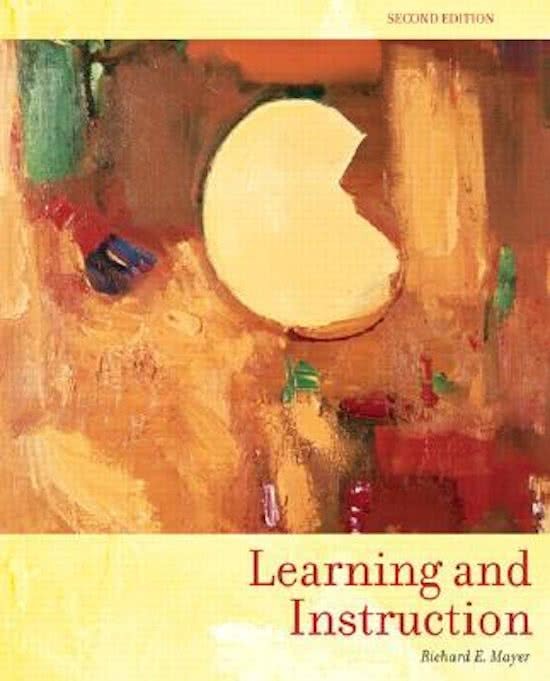 More book results for "learning"
Samenvatting Handbook of Learning Disabilities - Swanson Samenvatting van het boek Handbook of Learning Disabilities van Swanson. De samenvatting bevat de hoofdstukken die van belang zijn voor het tentamen (2, 3, 5, 7, 10 t/m 16, 18 t/m 21, 23, 24, 26 t/m 28, 30) en het artikel Verbal and visual-spatial working memory and mathematical ability in different domains throughout primary school van De Weijer-Bergsma et al. Samenvatting \'Human Learning\' van Ormrod Samenvatting van het boek \'Human learning\' van Ormrod. Gemaakt aan de hand van het boek en colleges van het vak \'leren en cognitie\'. Ook handig voor het nvo-examen. Samenvatting Human Learning (7th edition) Samenvatting van het boek Human Learning (7th edition) voor het vak Leren & Cognitie. Deze samenvatting bevat alle stof uit het boek aangevuld met college-aantekeningen en extra afbeeldingen. Dus H1 t/m H15, uitgezonderd H2. Veel succes! Learning Problems and Learning Disabilities - Extensive and well-organized lecture notes and information from the slides Comprehensive and well-organized notes from the Colleges of Learning Problems and Learning Disabilities. The information from the powerpoints is also in this file. The bold text and images come from the slides. The notes are the regular text. The notes are in English. Full summary Machine Learning Complete and comprehensive summary of the basic principles of machine learning, including k-nn, decision trees, perceptron, gradient descent, logistic regression and neural networks. Includes illustrations for clarification. from 2016-2017. Samenvatting blok 1.8 Learning Man Complete samenvatting van blok 1.8 Learning Man (EUR). Inclusief alle artikelen. Heb er zelf een 8 mee gescoord! Data Science: Machine Learning 2017/2018 - Summary Lectures Full summary including an introduction of Machine Learning and algorithms, such as Decision Tree, Perceptron, Gradient Descent, Logistic Regression (classifier) and Neural Networks. This summary also includes a section about Feature Engineering. Extra context and illustrations/graphs are also given, which makes this field of study a bit more understandable. Data Science: Machine Learning 2017/2018 - Cheatsheet For the Machine Learning exam it is allowed to keep a cheat sheet of 1A4. This is specially made so that all subjects of this course are described in detail, such as Decision Trees, Perceptron, Gradient Descent, Feature Engineering, Logistic Regression and Neural Networks. You are allowed to bring cheat sheet (1A4) with you. On this cheat sheet, all the necessary information (and more) are available on just two sides of paper. The following subjects are included: Decision Trees, Perceptron, Gradient Descent, Feature Engineering, Logistic Regression and Neural Networks.